Character Options Postman Pat figures were initially available in twin packs, in three packs, with the Postman Pat vehicles or in the Postman Pat playsets. From mid-2010 the figures were also released single carded. Postman Pat toy figures available include Ajay, Ted Glen, Jess the cat, Mrs Goggins and Ben Taylor. There are several versions of the Postman Pat Figure. There are two versions of Jess, one with flying goggles. 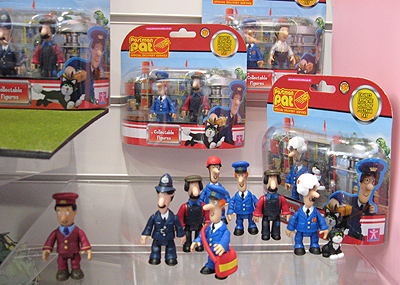 In 2013 Character re-released their Postman Pat figure range in revised parcel-themed packaging. Postman Pat figures are great fun and sure to become highly collectable Postman Pat toys. 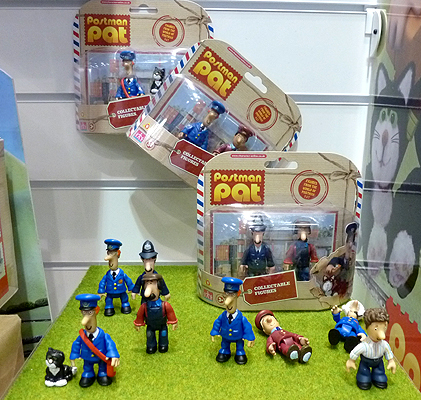 For older Postman Pat figures look in the Vintage Postman Pat section.